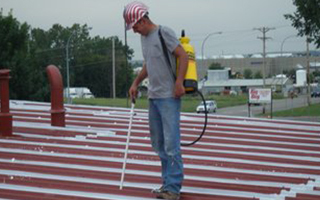 Your utility cost will immediately lessen when you apply our cool roof coating systems. They are energy efficient, seamless for leak-free performance, and highly cost effective as there is no need to tear off your old roof. Because our “green” coating systems are completely white, 80-85% of the heat is reflected off the surface of your structure. This dramatically drives down the the cost of your air conditioning bill, while putting less strain on your cooling equipment and building structure. Before 1977, the year Conklin made its introduction to the market, the roofing industry was a much different place. Most commercial flat roofs were covered in hot tar. While this may have created adequate protection from the elements, it did nothing for a building’s energy efficiency. The black tar absorbed the heat from the sun and transferred it directly into the building below. Conklin, which manufactures the roofing systems we use exclusively, knew there had to be a better way. 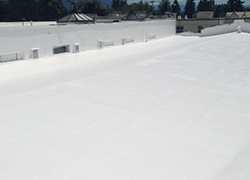 They set out to pioneer an acrylic roofing system that would change the roofing industry forever. 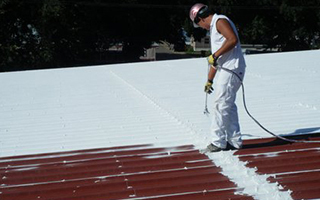 It is very simple to see why this new type of roofing system was given the name “cool roof.” It’s white color was its first major advantage against the common black tar roof which absorbed the heat from the sun. The white color did the exact opposite. It reflected the heat from the sun, and by doing that it also kept the entire building much cooler. Business owners saw the instant advantage that only a cool roof system could bring them, and they were quick to take full advantage of the performance, quality, and value that Conklin’s commercial roofing systems provided. It was a turning point for anyone who owned a commercial building with a traditional hot tar roof. It was a game changer. It is hard to deny the facts when you see the numbers presented in black and white. The image above makes the perfect example. 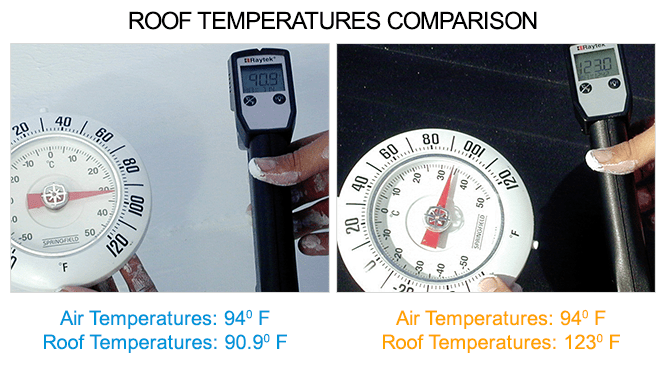 On the left is an example of the temperatures a black top roof endures. The outside air is 94 degrees. The black color has absorbed nearly all of that heat, and, as a result, the temperature of the roof is a blistering 123 degrees. The picture on the right shows quite a dramatic difference. On the right is a roof that has been covered in a Conklin acrylic cool roof system. The outside temperature is the same. It is 94 degrees, but look at the difference in the roof temperature. 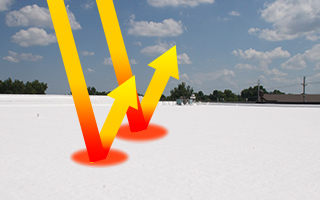 The roof temperature of the Conklin cool roof is an amazing 90 degrees. That is 23.6% cooler than a traditional black top roof. How do you think those numbers will affect the energy costs in a building? Air conditioning and refrigeration systems will not have to struggle to keep things cool under a Conklin cool roof system. When a hot tar roof starts to form leaks, it is only a matter of time until things start to get much worse. 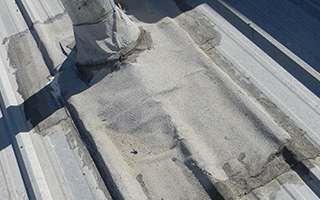 The leaks don’t stop, and most building owners decide that it is time to replace the entire roof system. 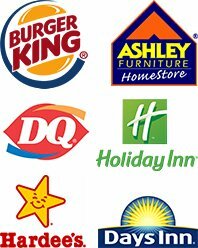 This choice amounts to excessive waste that is filling up landfills all over the United States. There is also all the fuel associated with transporting all of the old roof from the job site; not to mention all the labor costs that will start to add up very quickly. All of this is considered waste and it could easily be avoided with installing a Conklin cool roof system over top of the existing roof’s surface. Removing the landfill, transportation costs and labor from the equation makes the Conklin cool roof system the green choice! The Conklin cool roof statistics just don’t lie. 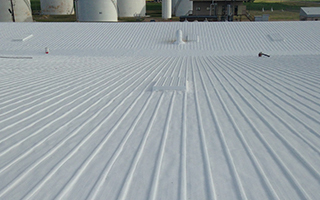 Their cool roofing system has been used on commercial and industrial buildings for over thirty years. They have also been applied to over 2 billion square feet of roofing. 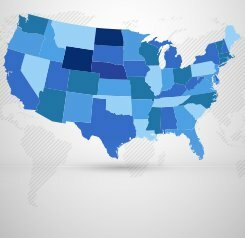 Conklin stands behind their roofing claims with a 20-year, non-prorated warranty that can’t be found by any other roofing company in the industry. 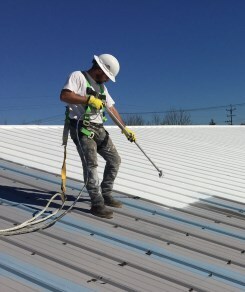 It is obvious to see why so many business owners, as well as our Choice Roof Contractors, have chosen to go with the Conklin cool roof system.